Much rear-axle work - practically all, in fact - calls for the use of the jack. True, the full-floating type of axle can have its shaft removed without jacking, but aside from differential removal there is little rear-axle trouble in which it is necessary to remove the shaft alone. In almost all cases, the axle must be jacked up. 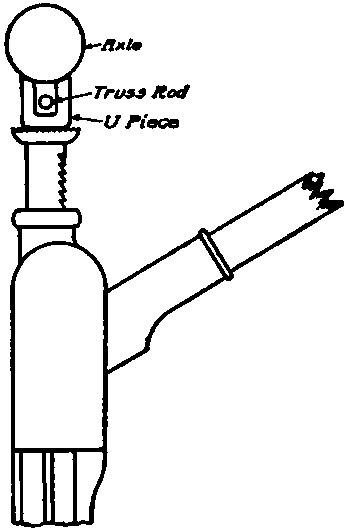 Many axles have a truss rod under the center and this is in the way when jacking; however, this can be overcome. Make from heavy bar iron a U-shaped piece like that shown in Fig. 97, on top of the jack, making the width of the slot just enough to admit the truss rod. The height, too, should be as little as will give contact with the underside of the axle housing. A good substitute for a jack is a form of hoist, Fig. 98, which will pick up the whole rear end of the car at once. This not only saves time and work, but holds the car level while jacking one wheel does not. Moreover, with a rig of this kind the car can be lifted so easily and high that it is easy to work under. The usual hoisting blocks are very expensive, but this hoist can be easily made by the ingenious repair man. This is made from an old whiffletree, to the ends of which are attached a pair of chains. For the lower ends of the chains, a pair of hooks are made sufficiently large to hook under and around the biggest frame to be handled; with the center of the whiffletree fastened to the hook of a block and tackle, the hoist is complete. By slinging the hooks under the side members of the frame at the rear, it is an easy matter to quickly lift that end of the chassis any distance desired. Fig. 97. Simple Arrangement for Avoiding Rear-Axle Truss Rod. Fig. 98. 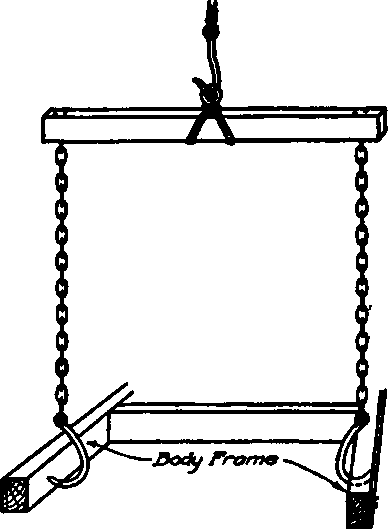 Simple Automobile Frame Hoist. Next to raising the rear axle, the most important, thing is to support it in its elevated position. To leave it on jacks is not satisfactory, for they will not raise the frame high enough, and furthermore, they are shaky and may easily let the whole rear end fall over, doing considerable damage. With the overhead hoist, the chains or ropes are in the way. So a stand is both a necessity and a convenience. In Fig. 99 several types are shown. A is essentially a workstand, intended to hold the axle and part of the propeller shaft while doing repair work thereon. It consists of a floor unit or base, built in the form of an A, with six uprights let into it, preferably mortised and tenoned for greater strength and stiffness. Then, the four rear uprights are joined together for additional stiffness and rigidity. If casters are added on the ends it can be more conveniently handled around the shop. Fig. 99. Types of Handy Stands for Rear-Axle Repair Work. The forms B are for more temporary work and consequently need not be so well or so elaborately made. The little stand C is a very handy type for all-around work. Stands of this kind, with the top surface grooved for the axle, are excellent to place under cars which have been put in storage for the winter. The stand D is, like A, a workstand pure and simple. In this however, the dropped end members allow supporting the axle at those points, while the elimination of central supports gives plenty of room for truss rods. This type of stand would preferably be made from metal, pressed steel or small angle irons being very good. Every repair shop should have a considerable number and variety of stands, made as the work demands them, and made just to fit this particular class of work. Many times, a car may be brought in for rear axle repair on which the repair man cannot find any trouble. Many an axle often develops an elusive hum, or grinding noise, which not only defies location, but is not continuous. The writer had such a one at one time, and was sure that the bevel gears were out of alignment and were cutting one another. It was a low pitched whine which was not apparent at low speeds, but began to be heard around 18 to 20 miles an hour, and at times was very apparent. The noise was very annoying, but tearing down the rear construction showed absolutely no trouble so the noise could not be at that point. Sometime later the noise was definitely located in a pair of worn speedometer gears on the right end of the front axle. That is, the supposed rear axle trouble was not on the rear axle at all. A good way to listen to rear axle hums out on the road is to lay back over the rear end of the car. Fig. 100, with the head against the top of the seat and projecting over slightly, and with the hands cupped in front of the ears, so as to catch every noise that arises. The larger sketch shows the general scheme, the small inset giving the method of holding the hands. When the sound arising from the axle is a steady hum, the gears are in good condition and well adjusted. If this sound is interrupted occasionally by a sharper, harsher note, it may be assumed that there is a point in one of the gears or on one of the shafts where things are not as they should be. 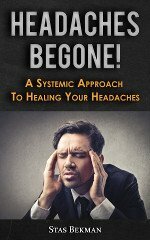 By trying the car at starting, slowing down, running at various speeds, and coasting, this noise can be tied to something more definite, some fixed method of happening. In advance of actual repair work, including tearing down the whole axle, the gears can be adjusted. This can generally be done from outside the axle casing and without a great deal of work. If the adjustment makes matters worse, it can be reversed, or if it improves the situation, the adjusting can be continued, a little at a time, until the noise gradually disappears. Fig. 100. Listening for Rear-Axle Noises. Fig. 101. Diagram Showing Method of Checking. Up Ford Axles. Many cases of bent Ford rear axles can be fixed without taking down the whole construction. The principal point is to find out how much and which way the axle is bent. By removing the wheel on the bent side, and placing on the axle end the rig shown in Fig. 101, the extent of the trouble can be indicated by the axle itself. The rod is a long, stiff, iron one, fastened permanently to an old Ford hub, with its outer end pointed. The rig is placed on the axle and held by the axle nut, but without the key, as the axle must be free to turn inside the hub. With the pointed end of the rod resting on the floor, and with high gear engaged, have some one turn the engine over slowly so as to turn the axle shaft around. As it revolves, the hub will be moved and the pointed end on the floor will indicate the extent of the bend. By marking the two extreme points, and dividing the distance between them, the center is found. Then a rod can be used as a bar to bend the axle until the pointed rod end is exactly on the center mark. A little practice with this rig will enable a workman to straighten out a Ford rear axle in about the time it takes to tell it.